If you’ve been waiting to drop your contract with one of the big carriers and go prepaid, but haven’t found the unlocked phone to do it with yet, today might be your lucky day. 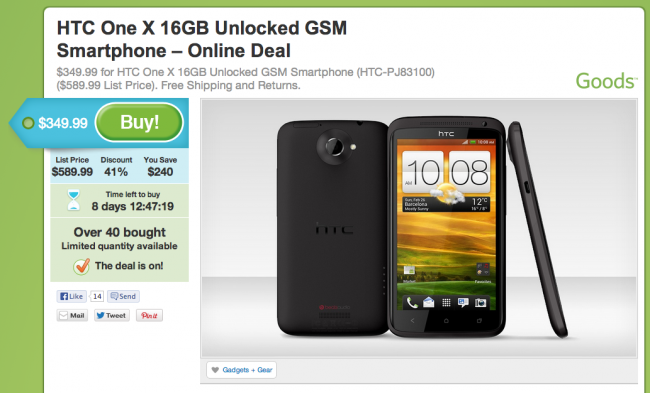 Groupon is hosting a deal that gets you the HTC One X, the same phone I used in our prepaid carrier test, for only $349.99 with free shipping. Incase you need a refresh on the specs, the One X has a 4.7″ 720p SLCD display, a 1.5GHz Tegra 3 quad-core processor, 1GB of RAM and an impressive 8MP camera on the rear, rounding out the spec sheet. With this unlocked phone you’ll get access to T-Mobile or AT&T’s HSPA and 3G networks, depending on whichever carrier you choose to buy into. Not a bad phone for the price, but you could also get the 16GB Nexus 4 for the same money. Which one would you choose?